KAMPALA – Following a long weekend, courtesy of the International Women’s day, – last week, the weekend has already knocked on the door. It is a norm at PML Daily to bring you captivating plot for you to keep you off the feet. Amakula Film Festival at the Uganda Museum. Happening this Friday, March 15 through Sunday, the 12th Edition of the Amakula Film Festival will take over the Uganda Museum with lots of films showcasing and premiering. Uganda’s oldest festive, Amakula Film Festive prides in creating a platform for our vibrant local film industry, by broadening access to and developing audiences for quality African film production and so much more. Gates will be opening as early as 2 pm for a free entrance and UGX10,000 tax after 7 pm. It is that time of the year, folks! It is here again! 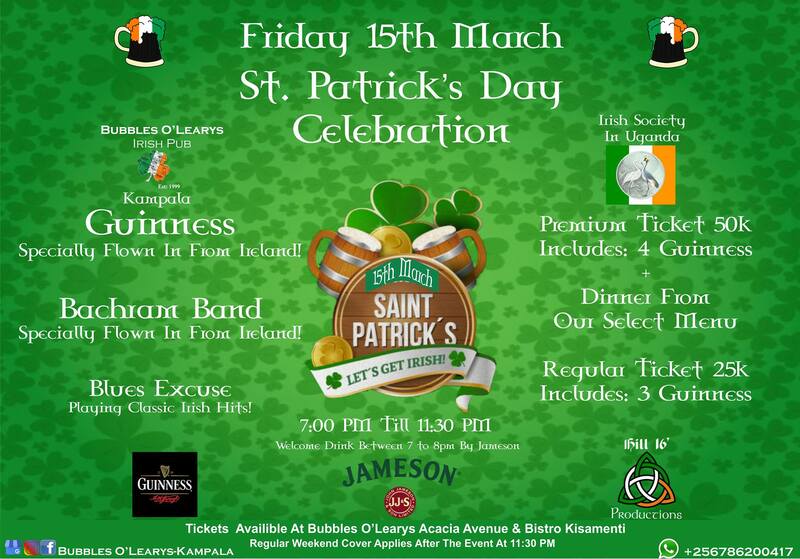 the St Patrick’s Day Celebrations at the Acacia Avenue based, Bubble’s O’Leary’s – Irish Pub. Entrance is shs 50,000 with 4 Guinness and Dinner then shs 25,000 with 3 Guinness. 3. Rabid Badgers Live Jazz Music. Lovers of Jazz Music, we got you covered!! I repeat, “we have you covered!” Isn’t that even more exciting!! Come and mingle with your fellow fun people at Lazy Pony this Friday opposite LeChateau on Ggaba Road. No cover charge!! This Saturday, rise to the plate! come and grace the Run For Maths Marathon geared to promoting mathematics especially among young girls. The chief runner gracing the event will be the Speaker of Parliament, Rt. Hon. Speaker Rebecca Alitwala Kadaga. Kits are available at Makerere University and designated points at only UGX20,000, UGX30,000 and UGX50,000. Come let’s run for this noble cause. 5. Beenie Gunter and BellJams Experience Launch. Talented artiste, Beenie Gunter has been in the music game for 5 years. Over this period, the singer has produced hits that have topped chats despite never attempting to stage his own concert. The ‘Olina Work’ hitmaker will thrill his fans at Wave Lounge, Acacia Avenue, come Saturday 16th March – courtesy of Bell Lager’s music platform #BellJamz’s new fans experience dubbed Bell Jamz Listener’s Party. 6. HiPipo Awards at Serena Hotel. Kampala’s reknown awards running the entertainment scene are taking place this Saturday at Kampala Serena Hotel. Come cheer your favourite artists as they walk away with their accolades. Tickets go for Shs 100,000 and a table Shs 3M. Drum roll!!. On your marks! Get set!! Go!… Do you have what it takes?? the Skill, sizzle and sassy drive?? Can you conquer Kampala’s ginormous seven (7) hills?! This Sunday, the annual NSSF 7 Hills Hash run returns bigger and better!! All proceeds will be dedicated to raising funds to support KCCA primary schools. 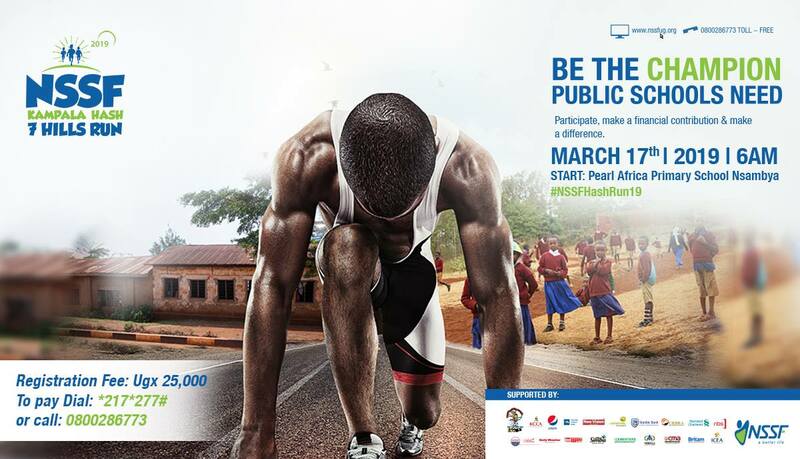 The start-off point will be at Pearl of Africa School in Nsambya and kits will go for Shs 25,000. 8. Motocross National Championship at Busiika. The mountain Dew national motocross championship is happening this Sunday at Busiika / Extreme Adventure park. It is time to witness your speed Merchants take the lead. Entrance is ONLY UGX20,000. 9. Educate an Orphan Run. From Networking, exercising, helping to philanthropy, the all in one event will be held Sunday, March 17 at Freedom Square, Makerere University. Let’s come support this noble cause at shs, 10,000 shs 20,000 and Shs 50,000.